All books, brochures, and CD-ROMs may be ordered online through the Cal-IPC shop or by printing the order form. Please make checks payable to Cal-IPC and mail to: Cal-IPC, 1442-A Walnut St. #462, Berkeley, CA 94709. All reports may be downloaded as free pdfs. You will need to fill in a web form so we can track use of these manuals. Land managers work to reduce the impact of invasive plants in wildlands. Their work in infested areas makes it especially important for them to follow BMPs to eliminate the spread of invasive plants. This manual presents a set of voluntary prevention measures and ready-to-use checklists to help those managing wildlands. The third edition includes BMPs for fire and fuel management in addition to prevention measures summarized in previous editions. Transportation and utility corridors are at-risk sites for the introduction and spread of invasive plants. Seeds and other propagules can be transported by vehicular traffic to other locations. Construction and maintenance activities can introduce or spread invasive plants through project materials and ground disturbance. These voluntary guidelines help to prevent the introduction and spread of invasive plants. 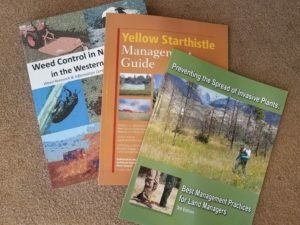 This manual was developed to help wildland managers further minimize the potential impacts to wildlife from herbicide applications, based on practices developed by those in the field and on the latest toxicology for particular herbicides. These voluntary BMPs were developed with the understanding that each situation and entity has different needs, constraints, and resources. This manual is a comprehensive guide for land managers to use when developing invasive plant management plans. It lays out a step-wise, easy-to-follow process designed to be applicable at any scale to help you complete a plan that is strategic, integrative, and adaptive to changing conditions. All reports may be downloaded as free pdfs. Some also are available for purchase as printed copies. Bioinvasions in a Changing World: A Resource on Invasive Species-Climate Change Interactions for Conservation and Natural Resource Management (2014) – Cal-IPC assisted with this report that provides an overview of the connections between invasive species and climate change then looks at how these communities approach conservation and natural resource management. From 2008-2010, Cal-IPC mapped Arundo donax at high resolution on all coastal watersheds in California from Monterey to San Diego. Impacts from Arundo invasion were calculated over the study area, including impacts to biomass production, water use, fire, geomorphic and fluvial processes, and endangered species. This PDF report presents statewide risk maps and priority management recommendations for 43 invasive plant species selected to be of special importance for the Sierra Nevada region of California. You may also be interested in the associated PDF report, Prioritizing Regional Response to Invasive Plants in the Southern Sierra. This project produced a summary of major research needs for California invasive plants that can be used to inform state policy and provide ideas for researchers, especially graduate students. The goal of this report is to capture the current state of knowledge on the use of fire as a tool to manage invasive plants in wildlands. The California Invasive Plant Inventory categorizes non-native invasive plants that threaten the state’s wildlands. Categorization is based on an assessment of the ecological impacts of each plant. The Inventory represents the best available knowledge of invasive plant experts in the state. Published by the University of California Weed Research & Information Center (Joseph M. DiTomaso et al.) Biology and control methods for 340 species. This two-volume, 1900-page book is the Weed most comprehensive weed identification book ever produced in the United States. This guide begins with a description of the biology and ecology of yellow starthistle and provides a comprehensive overview of treatment methods for yellow starthistle. Published by the Watershed Project and Cal-IPC, the Weed Workers’ Handbook explains how to remove more than 35 of the San Francisco Bay Area’s most invasive plants. This book provides specific information about the biology and control of 78 nonnative plant species that are listed by Cal-IPC as being of greatest ecological concern in California. This CD allows you to identify 200 weedy grasses using only plant parts visible to the naked eye. The intuitive keys offer a great way of self-tutoring on grass identification. PC format. A companion to Grass and Grass-Like Weeds of California, this CD includes interactive keys to 750 weed species. PC format. We can provide up to 10 brochures at no charge. E-mail info@cal-ipc.org to request. Larger quantities may be purchased through the Cal-IPC online Shop. Provides alternatives to invasive plants for gardeners, landscapers, and others in the horticultural community. Versions for San Francisco Bay Area, Southern California (English and Spanish), Central Coast, Central Valley, Sierra Foothills, Trees of California, and Aquatic Plants. What you should know about invasive plants in California. This PDF file introduces a general audience to the ecological and economic impacts of invasive plants. Lo que usted debe saber acerca de plantas invasoras en California. Este folleto introduce a una audiencia general los impactos ecológicos y económicos de las plantas invasoras. La versión en español esta disponible sólo en un formato pdf. Help stop the spread of this invader to California with this multi-language brochure produced by Cal-IPC and partners. The brochure provides a description of Japanese dodder and information on how to report it in English, Spanish, Mandarin, and Hmong. These brochures are out of print.